Open Vs. Closed, What does it Mean? Closed Cell Foam is dense and strong. When using this product it can help prevent drafts and keep temperatures regulated. It also has the power to strengthen walls. Closed cell foam has a higher r-value than other types of foam. Usually with an R-value of 6.0 per inch and can have up to R-values of 7.14 per inch. 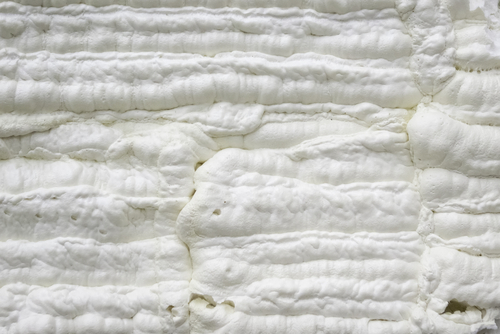 Because of the great density that closed cell foam provides, it creates better insulation and is resistant to water. Even when you find moisture build up, spray foam is up for the challenge and can fight against creating more moisture which would lead to mold and bacteria. Open Cell Foam is a little less common. It has a lower R-value coming in the range at about 3.6 to 3.8 per inch. It doesn’t have water resistance like closed cell foam, and its low R-value means that its resistance to heat level is lower, but we are here to tell you, it does have its advantages. One of them being it is more affordable. Another is that because open cell isn’t as dense as closed cell, this spray foam expands once applied allowing itself to be inserted into hard to reach places, its best used on those little cracks that we can’t seem to fill. It also has great sound deadening properties. For example, if someone is insulating a basement apartment, there is two benefits: One, It can provide the insulation for that room while secondly, shielding the upstairs for noise. The less expensive alternative does not lead to more expensive repairs in the future. But take a look at the end goal you are trying to accomplish and figure out which is right for you.